Iowa Wild issued the following announcement on March 23. Iowa Wild (34-20-7-5; 80 pts.) overcame a three-goal deficit but couldn’t get the game-winner as the Stockton Heat (26-28-4-2; 58 pts.) defeated the visitors by a score of 5-3. Stockton took a 1-0 lead as forward Buddy Robinson converted on the power play at 13:12 in the first period. Skating down the left side of the ice, forward Glenn Gawdin sent a cross-rink pass to Robinson right as he entered the offensive zone. Robinson skated to the top of the right circle before ripping a shot past goaltender Andrew Hammond (34 saves), beating him stick side. Through the end of the first period, Stockton led 1-0 while Iowa had the 14-8 shot advantage. Heat forward Dillon Dube gave the home team a 2-0 lead just more than a minute into a second period. Tic-tac-toe passing by the Stockton offense led to Dube with the puck on his stick in the slot. Dube shot the puck past the sprawling Hammond for the power-play score. Robinson and Gawdin earned the assists on the play. Stockton then took a 3-0 lead at 12:11 in the middle frame as Robinson logged his second of the game. Defenseman Rob Hamilton took a shot from the point that was blocked by the Wild defense. Forward Matthew Phillips then picked up the loose puck and kicked it to Robinson in the slot. Robinson beat Hammond for his 14th of the season and first multi-goal game of the year. Iowa finally got on the board as forward Will Bitten capitalized on a breakaway at 14:42 in the second stanza. In his own zone, forward Gerry Mayhew sprung Bitten for a breakaway with two defenders chasing him. Goaltender Jon Gillies (38 saves) stopped Bitten’s initial shot, but he followed up his own rebound and snapped it over Gillies’ left pad for his ninth of the season. Less than two minutes later, forward Dmitry Sokolov brought Iowa within one with his 14th of the year. Sokolov blocked a shot in the defensive zone then went on the attack. Chipping the puck to himself to enter the offensive zone, Sokolov skated to the right faceoff dot and wristed a shot past Gillies’ blocker to cut Stockton’s lead to 3-2. Heading into the third period, Iowa trailed 3-2 but led in shots 31-23. The Wild pulled even with Stockton as defenseman Nate Prosser netted his first goal in an Iowa sweater at 15:58 in the third period. Mayhew had the puck low and curled out of the corner to see Prosser crashing the slot. Prosser received the pass from Mayhew and fired a shot over Gillies’ glove to make it a 3-3 game. Defenseman Michael Kapla earned the secondary assist on the play. Just less than two minutes following Prosser’s goal, Stockton regained the lead when Phillips notched his 12th tally of the year. Defenseman Matt Taormina ripped a slap shot from the point that was saved by Hammond, but Phillips on the doorstep knocked home the rebound. Winger Ryan Lomberg registered the secondary assist on the play. 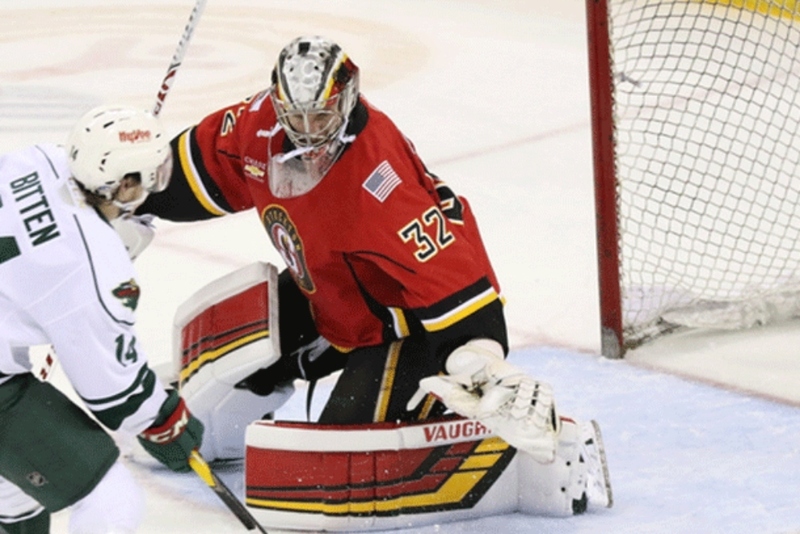 Forward Tyler Graovac iced the game with an empty-netter at 19:50 as the Heat skated away with a 5-3 victory. Iowa finished the game leading in shots 41-39 and went 0-for-6 on the power play and 4-for-6 on the penalty kill. Iowa and Stockton are slated for a rematch Sunday evening with a 7:00 p.m. CT puck drop.